This research project aims to investigate the relationship between women’s [political] inclusion and their ability to deliver gender-inclusive development, shaped by the character and dynamics of political settlement as well as ideas and discourses on women’s political entitlements and gender equity. The selection of two pairs of countries using Levy’s (2014) typology – Rwanda and Uganda, representing the dominant party type, and Bangladesh and Ghana, representing competitive clientelism – enables a comparison between cases within each typology. It also allows for comparison across different types of settlements and investigation of whether and how the different types of political settlements that Levy identifies shape politics of recognition in meaningful ways. How do political settlements shape the relationship between women’s political inclusion and their actual influence in delivering improved entitlements for women? What factors shape the relationship between women’s inclusion in politics and their influence over policies such as girls’ education and reproductive health, and laws on domestic violence? What role did pro-women policy coalitions play in changing the gendered nature of settlements around the above-mentioned policy areas? What impact did the broader political settlement, including critical junctures in its formation and clientelist forms of politics, have on the ability of women, and actors who represent gender equity interests, to influence gender equity outcomes in these selected areas? 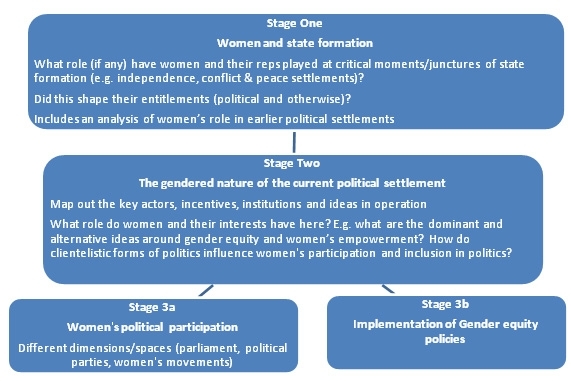 This project uses a comparative approach in order to generate findings that contribute towards strengthening a ‘political settlement plus’ approach and knowledge on the politics of securing gender-inclusive development. The project exploreS the relationship between gendered politics of inclusion and politics of influence at two levels: an in-depth study of gender-specific legal and policy reforms; and a political ethnography on the agency aspect of drivers of these legal and policy changes, as well as the strategies they used for negotiations with others and for resisting or contesting both elite and non-elite groups. The main methods are qualitative, involving: mapping of key actors and events; content/discourse analysis of key documents on legal and policy change; and key informant interviews. This project contributes to ESID’s programme 4 – ‘the politics of identity and equity’. It has a cross-cutting focus on the dimensions of redistribution, particularly in terms of gendered impacts of health and education policies, and the role of transnational actors/discourses, given the influence of donors and global development, as well as gender discourses on promoting women’s political empowerment and gender equity policies. The research also has particular significance for unpacking gender-inclusive development in the countries studied under this project. Sohela Nazneen, Sam Hickey and Eleni Sifaki (eds.) (2019). Negotiating Gender Equity in the Global South: The Politics of Domestic Violence Policy. Routledge. OPEN ACCESS. Burnet, J. E. and Kanakuze, J. d’A. (2018). ‘Political settlements, women’s representation and gender equality: The 2008 gender-based violence law and gender parity in primary and secondary education in Rwanda‘. ESID Working Paper No. 94. Allah-Mensah, B. and Osei-Afful, R. (2017). ‘A political settlement approach to gender empowerment: The case of the Domestic Violence Act and girls’education policy in Ghana‘. ESID Working Paper No. 91. Nazneen, S. and Masud, R. (2017). ‘The politics of negotiating gender equity in Bangladesh‘. ESID Working Paper No. 76. ‘The politics of promoting gender equity in Uganda‘. ESID Briefing Paper 19. Ahikire, J. and Mwiine, A. A. (2015). ‘The politics of promoting gender equity in contemporary Uganda: Cases of the Domestic Violence Law and the policy on Universal Primary Education‘, ESID Working Paper No. 55. Nazneen, S. and Mahmud, S. (2012). ‘Gendered politics of securing inclusive development‘. ESID Working Paper No. 13. ‘Researching the politics of gender: A new conceptual and methodological approach‘. ESID Briefing Paper 7.